My grandmother liked to claim that she could smell money at 100 paces and if that's true, then there must have been an almighty whiff emanating from our guest today. 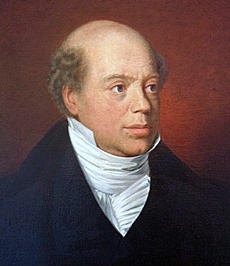 Nathan Mayer Rothschild was money, his family name legendary in financial circles. In fact, at one point during the 19th century, legend has it that the Rothschilds were the wealthiest family in the world. Rothschild was the son of banker Mayer Amschel Rothschild and his wife, Gutle Schnapper. His father had built a hugely successful banking career in Europe and looked now for opportunities to expand his interests into England, deciding that the person to lead this charge was the 21 year old Nathan. With £20,000 start-up capital, the young Rothschild was dispatched to Manchester with the intention of launching the first overseas Rothschild business, this one specialising in textile importing. Ambitious, dedicated and hugely intelligent, the young man found himself in his element and with the Manchester business established, soon moved to London. Here his successes continued and Rothschild elected to remain in England, where he became a naturalised citizen in 1804, establishing a bank in the capital within a year. 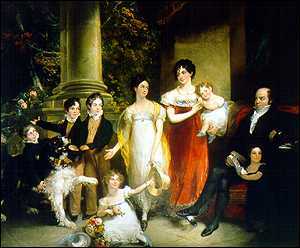 In 1806 he followed his business success with a personal one, marrying Hannah Barent-Cohen, with whom he would eventually have seven children. Unusually for visitors here on Gin Lane, all of those children would survive to adulthood. It seemed that Rothschild could not put a financial foot wrong, moving effortlessly from textiles to finance to bullion, his bank responsible for paying Wellington's troops across Europe. The Rothschild family were of vital importance on the continent and established a vast private network who were responsible for moving both gold and intelligence throughout Europe undetected. Indeed, Rothschild knew the outcome of the Battle of Waterloo 24 hours earlier than the government itself; he used the knowledge to his advantage, making a series of shrewd deals in the small window of opportunity before Wellington's victory became public knowledge. However, for all his business successes, Rothschild was less concerned by the vagaries of titles and though he was granted the title Freiherr (Baron) in 1818, he chose not to use the prefix. By the mid 1820s, Rothschild sat at the very pinnacle of London's banking world, his financial clout stretching right across Europe and beyond. Indeed, he even provided a financial bail out to the British government on more than one occasion. When an infected abscess finally carried Rothschild off, he left an enormous empire that would be taken on by his son, Lionel Nathan Rothschild. The family remained financial titans throughout the century that followed and their name remains famed today, with the modern Rothschilds involved in a vast range of industries, businesses and philanthropic activities. Ah, interesting you should say that and thank you for doing so! I did deliberate over whether to include Rothschild for the very reasons you state but, as a fairly colossal figure in Georgian London, in the end I decided to let him have his moment. Perhaps it is worth mentioning that Nathan Rothschildt had his working pillar at the London Exchange. He stood stiff and with his eyes closed until the moment someone put a question to him. This never took long, and then he took his post again assuming the still posture, which he certainly knew was different from the ordinary and the jewish businessmen. At the moment I am reading more of his financial world in a wonderful novel of Anthony Trollope, "The way we live now". USA Railways, venture money (and implied land theft on the largest imaginable scale), the meaning of toasts (by whom), interconnections, prestige etc etc. Nathan's sons, a troika, took over the business. I do love Trollope's work, it feels like just stepping into his world. There is something utterly fascinating about Rothschild to me, I might have to revisit the family! Where does American imperialism come into it? I didn't see any references to America at all. Though capitalism can envoke selfishness and a "me, me, me" attitude, it has shown that it is one of the most efficient business models around. What a charming family group, Catherine. Congratulations for including the Rothschild, some of the most important movers and shakers of the 18th&19th centuries.